Hi- here’s a really quick and easy no chopping 3 ingredient green smoothie- and takes about that long to make- about 3 minutes! I decided to explore Coles to see what pre-packed greens I could buy for a quick and simple green smoothie. This is a great one to make a newbie who hasn’t tried a green smoothie before. 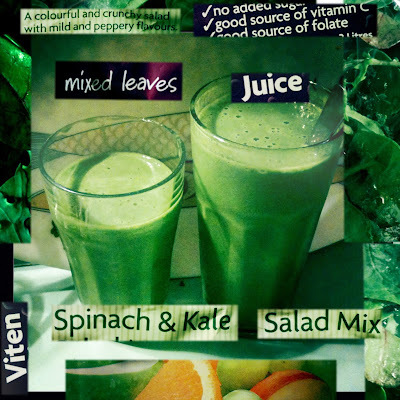 It uses the standard beginner combo of 2 cups liquid/ice / 2 cups greens and frozen banana. The liquid is a cup of Coles Viten Juice and about a cup of ice. This juice has a combo of grape, orange, apple, peach, apricot, pear, mango, passionfruit, lemon and guava puree. This is yummy in this green smoothie and not very expensive $2.55 for 2 litres and I have also frozen some in ice cube trays to use when I’m low on fruit. For the greens I used a $3.49 120 gms bag of prewashed Coles Spinach and Kale Salad mix- this has kale, beet leaves, rocket and baby spinach. It was exciting seeing kale and baby beet leaves finally make it to these prepackaged salad mixes which are perfect for green smoothies-drink your salad! this is a really great blog for those that want a green smoothie on the go.still struggling to make it a habit and it has been over 2 weeks…so naughty! Thanks! I was in Coles today and they now sell 350gm bags of prewashed English spinach leaves along with a curly kale rocket baby spinach mitsuna and beet greens salad mix. Not organic but definitely convenient for green smoothies.